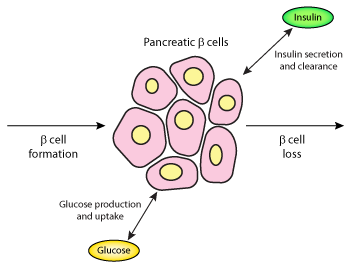 Please note that this particular variant of the model is the basic core model which includes three main variables: plasma insulin concentration (x), glucose concentration (y), and the density of the pancreatic beta cells (z) - calculated by equations 11-13. Parameter values have been taken from the legend of figure 2. The model runs in COR and OpenCell and the units are consistent throughout, however the CellML model does not recreate the published results for x (it does for y in figure 2).